Vegan Treats | Hectic life. Healthy girl. What are Omega 3 Fatty Acids? Why are they Important? What are Vegan Sources of Omega 3s? You’ve probably seen “a good source of omega 3’s” imprinted on various boxes and bags around the super market and wondered “what are omega 3’s and why should I give a damn?” You may have heard that Salmon and other fresh water fish are a great source of Omega 3’s – but that’s not the only place in nature where you can get this amazing nutrient. There are plenty of vegan sources of Omega 3’s including spirulina (algae), nuts, flax, and vegetables. Omega 3’s come from a family of unsaturated fatty acids. Even the healthiest diets need a moderate amount of healthy fats, and omega 3’s are crucial to healthy, sustainable living. They’re considered “essential” fats – Essential fats are so defined as they are vital for, but cannot be made by, the human body. Only plants can make the vital omega 3 and 6 parent fatty acids, human enzymes can then convert these to other fatty acids such as eicosapentaenoic acid (EPA) and docosahexaenoic acid (DHA) which are building blocks of the brain and nervous system. They are needed for the integrity of every cell membrane in the body so particulalry important for the health of vital organs such as the heart and brain. Omega 3’s are found in foods including walnuts, some fruits and vegetables, and coldwater fish such as herring, mackerel, sturgeon, and anchovies. Fish contain omega 3’s because they eat microalgae that contains omega 3’s. Other vegan sources of omega-3s include canola oil, broccoli, cantaloupe, kidney beans, spinach, grape leaves, Chinese cabbage, cauliflower, spirulina, and walnuts. The omega 3 parent fatty acid is called alpha linolenic acid (LNA or ALA) and comes from vegan seeds such as flax, hemp and pumpkin, from nuts such as walnuts, and to a lesser extent from soya and green vegetables. Through a series of enzyme-controlled reactions the human body converts this LNA into a number of vital fatty acids including EPA and DHA. Among their many roles EPA is needed for brain function, concentration, and vision, and is also converted into a powerful anti-inflammatory agent. DHA is needed as a building material , particularly for brain structure and so is especially important in pregnancy for the baby’s brain and nervous system development. Additionally, the benefits of omega-3s include reducing the risk of heart disease and stroke while helping to reduce symptoms of hypertension, depression, attention deficit hyperactivity disorder (ADHD), joint pain and other rheumatoid problems, as well as certain skin ailments. Some research has even shown that omega-3s can boost the immune system and help protect us from an array of illnesses including Alzheimer’s disease. Just how do omega-3s perform so many health “miracles” in people? One way, experts say, is by encouraging the production of body chemicals that help control inflammation — in the joints, the bloodstream, and the tissues. But even as important is their ability to reduce the negative impact of yet another essential type of fatty acid known as omega-6s. Found in foods such as eggs, poultry, cereals, vegetable oils, baked goods, and margarine, omega-6s are also considered essential. They support skin health, lower cholesterol, and help make our blood “sticky” so it is able to clot. But when omega-6s aren’t balanced with sufficient amounts of omega-3s, problems can ensue. In general, Americans eat too much Omega 6 and not enough Omega 3. You can replace some omega-6s from cooking oils with a third fatty acid known as omega-9 (oleonic acid). This is a monounsaturated fat found primarily in olive oil. Think you can get all of your omega 3’s through fish oil supplements? Think again. There are other healthy components of whole foods containing Omega 3’s that make it better for your body and soul – flax, for example, is heavy in fiber which helps lower cholesterol, regulate blood sugars, and improve digestion. Fish oil supplements also aren’t vegan and are just as prone to toxins and chemicals in fish and water supply as eating fish themselves. Add some Omega 3’s to your diet today! One of the things I enjoy least is going to a restaurant the night of Valentine’s Day. What a nightmare. Mediocre food. High prices. Elbow to elbow with other patrons. AWFUL service. Yet everyone flocks to the nearest restaurant slightly more expensive than they’re used to and stuffs their faces with prix fixe menus only to go home and fall into a food coma. Not us! My boyfriend, Jason, and I have never made a big deal out of Valentine’s Day (since we love each other the other 364 days of the year…), but we do like to stay in and cook together to honor the occasion. In past years, I’ve made a mostly vegan meal with a meat entree for him. But this year, as part of his (and mine) dedication to staying healthy, we did a total vegan dinner. What did he think of it? Drum roll…. He loved it! As a runner (and generally busy guy), Jason needs wholesome, filling meals and often gets hungry about an hour after eating an all-veggie salad. So I had to get creative to make him a great vegan meal that wasn’t a bunch of carbs. He was full before we even got to the entree! 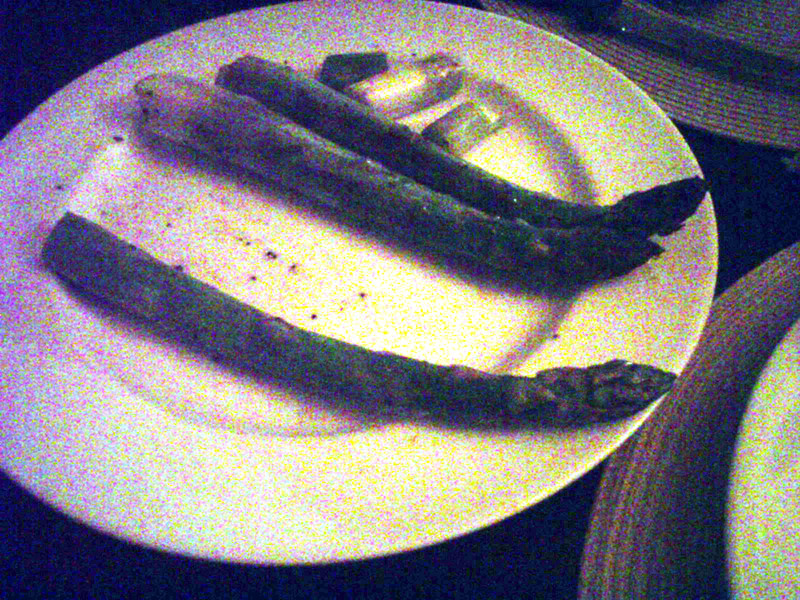 Organic asparagus, sauteed in a pan with a small amount of organic extra virgin olive oil, lemon pepper, and sea salt. This is a super easy dish to make – just pick up asparagus at your local farmer’s market or grocery store, throw it in a frying pan with a little bit of olive oil on medium heat. After you’ve cooked them for a little while, just drizzle some lemon pepper (or lemon juice plus pepper), and lightly salt to taste. You can also have it raw – just don’t heat above 118 degrees. This is my go-to dish when I’m dining alone, but it also makes a great starter. Salads can be ruined by 1. not enough awesome ingredients, and 2. too much dressing. 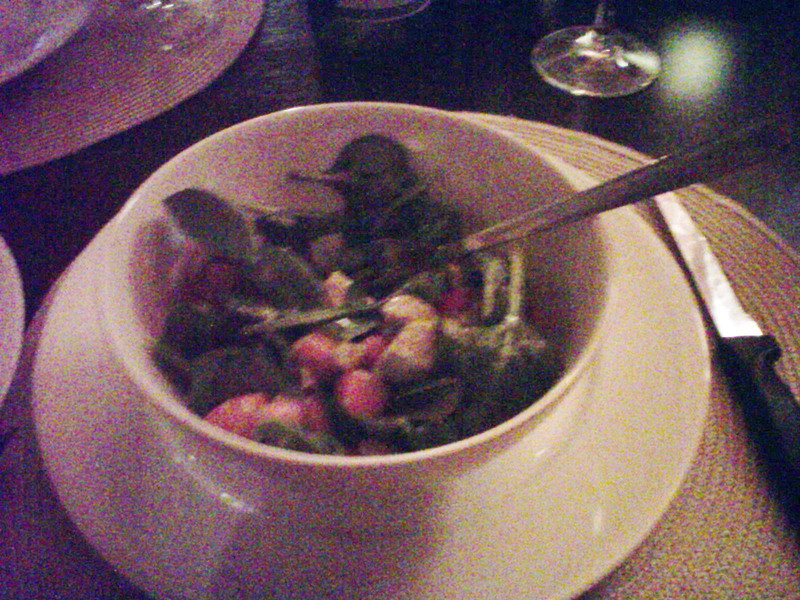 Our salad had spinach, tomatoes, carrots, cucumber, walnuts, and organic avocado. I added 1 tbsp of light balsamic dressing (Newmans) to the ENTIRE bowl of salad (not just my serving). The key to dressing is to always always always measure it out. Don’t just pour it all over the salad. You only need a light taste! Not salad soup! 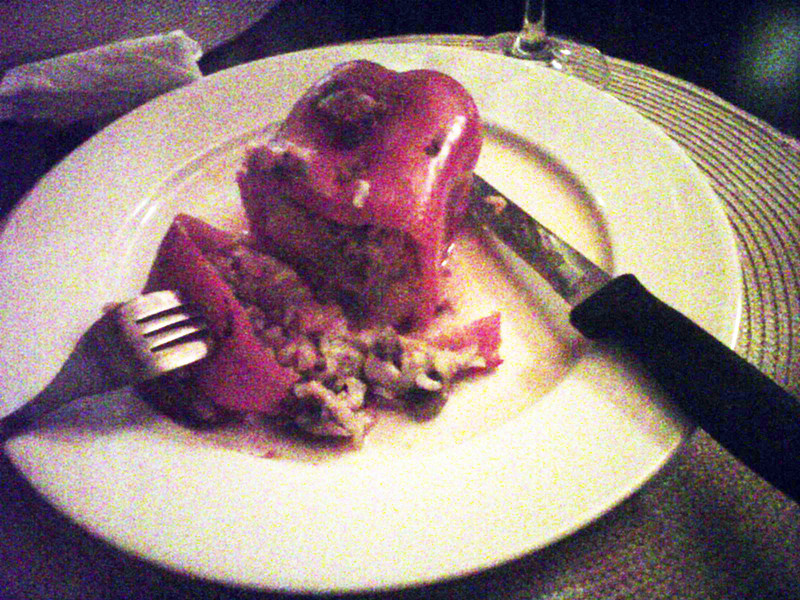 Stuffed peppers! You can see the original recipe for this dish, but I usually just wing it. I made 4 of these so we could have two as left overs but one pepper serves one person just fine. The original recipe has many more ingredients – it’s totally up to you! Cook 1 cup of organic brown rice (a great whole grain!) with 2 cups of water, 1 tbsp of Earth Balance “butter,” and some sea salt in the sauce pan. This can take up to 45 minutes to cook, so start this early! Cut out the tops of the red peppers, wash them, set them in a cooking pan (a bread sized pan is fine). Set your oven to 350 degrees (this dish cannot be served raw). In a wok, saute the olive oil, onions, squash (finely cut), mushrooms (finely cut), peppers (finely cut), garlic, and drizzle on salt and pepper for taste. Pour the sauteed veggie mix in a bowl with the brown rice and stir. Using a spoon, scoop the mixture into the stuffed peppers. Cover with tomato sauce. Heat in the oven for 35-45 minutes (this is really for heat preference, all of the ingredients are already cooked or can be eaten raw). While the peppers are heating, enjoy your appetizer and salad! I try to stay away from sugar (fruit) after noon, but I like to make an exception for holidays. I cut up organic strawberries, put tooth picks in them, and had them for dipping in Whole Foods vegan chocolate pudding. The pudding is pretty cocoa forward (I’m sure you can make your own but I got lazy) but it was delicious! Overall a very successful vegan dinner – boyfriend approved! Oprah Kicks Off Vegan Week! This is fantastic news: Oprah and 378 of her staffers are committing to a vegan diet for a one-week “vegan challenge”! Even better, Oprah is going to devote today’s episode of “The Oprah Show” to talking about veganism, including interviews with vegan activist Kathy Freston and food writer Michael Pollan, as well as a behind-the-scenes look at a meat-processing plant with Lisa Ling. This dish is inspired by several tsimmes recipes in Joan Nathan’s “Jewish Cooking in America.” Tsimmes, a Yiddish word that means “fuss,” doesn’t have to be fussy at all. 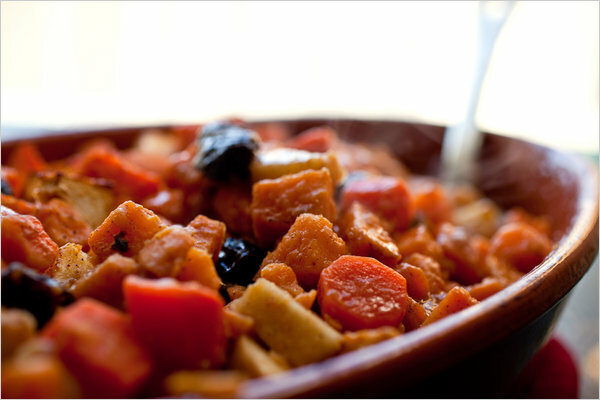 Sometimes the dish contains meat (and is fussier than this one), but sometimes it’s just fruit and vegetables. Warning: You may find yourself eating this for breakfast. Note: Sweet potatoes may be labeled as yams. Look for dark orange flesh. 1. Preheat the oven to 375 degrees. Butter or oil a 3-quart baking dish. 2. Place the carrots and sweet potatoes in a steamer set above 1 inch of boiling water, and steam for five to 10 minutes, until just tender. Drain and toss with the remaining ingredients in a large bowl. Combine well, and scrape into the prepared baking dish. Place in the oven, and bake 40 to 50 minutes, stirring every 15 minutes, until the sweet potatoes and carrots are thoroughly tender. Dot the top with butter, and bake another 10 minutes until the top is lightly browned. Remove from the heat, and serve hot or warm. Advance preparation: You can assemble this dish several hours before baking. You can bake it a day or two ahead of serving; reheat it in a medium oven. The holidays, as great as they are, always seem to add a couple pounds to my waistline. It’s all those delicious treats, cookies and candy that surround us in the late months of the year. Thank goodness January gives us the perfect opportunity to cleanse and detox, get back on the wagon and eat right, exercise, and shed those extra pounds. After reading her book I immediately lost 10 pounds just by 86ing most of the processed crap out of my diet. Not only will you lose weight, but you will have an abundance of energy, all from natural foods that this gorgeous Earth provides for us. None of this sugar-free over processed and refined junk, just real food. I promise once you eat the real stuff, you’ll never want to go back! Eat up your veggies and whole grains! I guarantee you will never get hungry and will have so much energy! 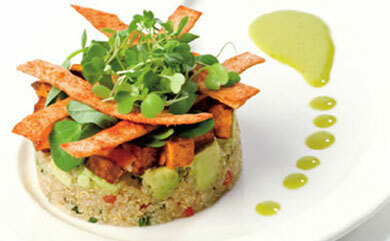 Some grain examples: Brown rice, quinoa, barley, millet, oats, wild rice and the list goes on. For veggies, try to get what’s in season. Many people believe that our bodies are also “in season” and react positively to local produce. Eat up some delicious daikon! Daikon is in the raddish family and is a natural diuretic. You can use it in soups, stews, vegetable dishes, and even tea! Bring the carrot, daikon, umeboshi plum, and 1 cup of water to a boil in a small saucepan. Reduce the heat, and simmer for about 3 minutes. Add the shoyu and simmer for 2 to 3 minutes longer. Add the nori, if using. Drink hot once a day for 10 days. After that, drink three times a week for three weeks. If you want to continue, a couple of times a week should do the trick. Chew your food properly! The more and better you chew the more energy you will get from the food and the more satisfied you will feel. Do your best to eliminate white sugar out of your diet. White sugar is addictive and can slow down weight loss. 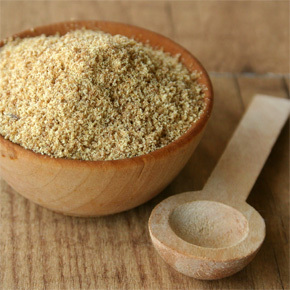 Transition to sweeteners like brown rice syrup to break your white sugar habit. Keep fattening and indulgent foods out of the house for a while; Even if they’re vegan. It’s ok to have something sweet every once in a while but keeping things in the house will only tempt you to indulge. Cut back on the salt consumption. Seasoning should taste mild. Too much salt can set you up to overeat or crave strong sweets. Eat a big nutritious breakfast in the morning. This will start your day out right and keep you full and energized, cutting the chances of an afternoon binge. For example, this morning I had a big bowl of fruit (1 banana and 1/3 cup blueberries) and topped it with some soy yogurt and granola. It was absolutely delicious and it kept me full until lunch. Oatmeal is also great but try to avoid the sweetened and flavored stuff. Regular ‘ol oatmeal is awesome with fruit, there’s no need for the extra sugar. Don’t be too hard on yourself! If you mess up, don’t give up everything that you’ve worked for. Just sit down, take a break, and snack on some veggies and grains and you will feel much better. Don’t eat anything 3 hours before bedtime. Do some kind of fun exercise three to five days a week. Whether it’s a jog around the park, or a yoga class at the studio down the street, get out there and move your body. If you follow these tips for the next few weeks you will see dramatic results in your body, mind, and spirit. Good luck and I wish everyone a very healthy and happy new year! 97% of egg-laying hens are confined to battery cages. Even if you’re not vegan, please be conscious of the food you buy, where it comes from, and how it’s maker or gardener is treated. The easiest way to do this is to get to know the folks who sell you your food. Make friends with your local farmers and don’t be afraid to ask questions! Also, if you want to try a safe and vegan detox, check out http://kaengraeng.com/. I forgot to mention that.